Driftt, a Cambridge-based collaboration startup founded by ex-HubSpot execs and recently backed by $15 million in new funding, has acquired productivity app maker Fetchnotes. The deal was specifically for the technology and the product Fetchnotes had built, as it turns out, as no one from Fetchnotes’s five-person team is joining Driftt at this time. Launched by HubSpot and Performable execs David Cancel and Elias Torres, Driftt hasn’t disclosed the specific details of its product plans, but recent reports have indicated more generally that it’s working in the team collaboration space, developing ways to help teams work together on documents across different services. Investors in Driftt include CRV, General Catalyst Partners, NextView Ventures, Founder Collective and HubSpot founders Brian Halligan and Dharmesh Shah. Driftt’s homepage points to the company developing a mobile-first service, as it explains that its tools are designed to help users “communicate visually” with friends and co-workers “in real-time from your phone.” And Driftt’s Twitter account has tweeted the occasional sneak peek at its app. The product, however, is in invite-only mode at this time. We understand that Driftt’s interest in Fetchnotes wasn’t necessarily just its mobile note-taking app, but also a new product called Thready it had in development. Fetchnotes co-founder and CEO Alex Schiff said the product they were building ahead of the deal was about creating shared spaces with groups of people that you could throw anything into – be it a note, a file, a photo, or whatever else. The idea had originally grown out of observing how some of Fetchnotes’ top users had ended up using the app – for lightweight mobile collaboration. “We did a lot of user research with the people that were sharing, and we found that what they wanted wasn’t a bloated project management solution or another cloud-based document repository — they just wanted a shared, simple, mobile-friendly place to throw stuff,” writes Schiff on the Fetchnotes blog announcing their exit. 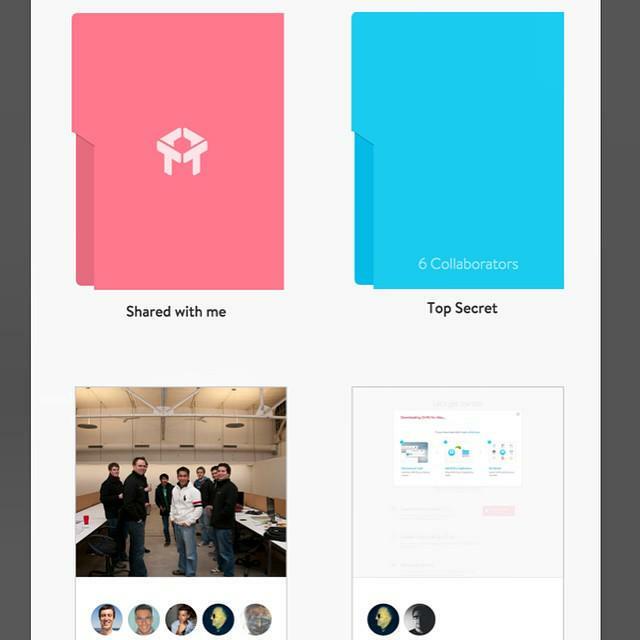 These shared spaces could be accessed by everyone from their mobile phone, sort of like a shared Dropbox folder, but for any type of content. And they could be used with anyone, even if they weren’t a user of the product itself, Schiff notes. At the time of the acquisition, the product was in beta testing with around 100 people. From the sounds of things, that vision aligns very closely with the direction Driftt is also headed, which is what sparked interest in the deal. “In the end, we both want to help people spend more time doing the work they love and less time fighting the tools they use to manage it,” says Schiff. Both he and Torres came to HubSpot in 2011 following its acquisition of their personalization technology startup Performable in 2011 for $20 million. They left last summer to work on Driftt, just ahead of the HubSpot IPO. “What we saw in Fetchnotes was a product that is truly mobile first,” explains Cancel of the acquisition. “I believe Evernote, Dropbox, Slack and others are building amazing products but their products are still 95% desktop-focused with mobile acting as just an add-on,” he continues. “On top of that Evernote has ignored enterprise and business users. We plan on building out Fetchnotes to take on that market. We are going to do what we did at HubSpot and build an all-in-one mobile platform for businesses that frees people from having to sit in an office, or a chatroom, all day in order to be productive,” Cancel adds. The Fetchnotes/Thready team will remain on for the time being in an advisory capacity as the transition to Driftt completes. Fetchnotes, meanwhile, will stay up-and-running while it’s being integrated with Driftt.